The DSWD Kalahi-CIDSS Northern Mindanao Delegation to Pagsaulog 2018: The 2nd National Community Volunteers’ Congress. The delegation is composed of the DSWD Kalahi-CIDSS Staff and Community Volunteers. 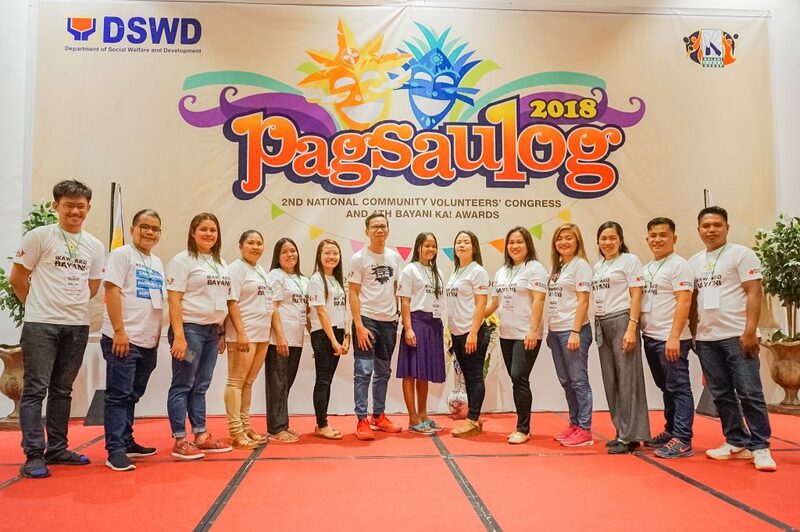 The Department of Social Welfare and Development (DSWD) Kapit-Bisig Laban sa Kahirapan Comprehensive and Integrated Delivery of Social Services – National Community-Driven Development Program (Kalahi-CIDSS NCDDP) recently concluded “Pagsaulog 2018”, a Cebuano term which translates to “Celebrate”, the 2nd National Community Volunteers’ Congress and 4th Bayani Ka! Awards, October 2-4, Cebu City. Pagsaulog 2018 provides a venue for community volunteers and Bayani Ka! Awardees to freely share and exchange stories, initiatives, and unique practices that helped realize CDD in their localities as the event facilitated breakout sessions. Pagsaulog also recognizes the efforts and initiatives made by the community volunteers, partner LGUs, and other stakeholders in pushing for the institutionalization of Community-Driven Development (CDD) in their respective municipalities. Community volunteers from the provinces of Bukidnon, Misamis Oriental, Lanao del Norte, and Misamis Occidental comprise the Northern Mindanao delegation. The delegation also represents the regional Bayani Ka! Awards winning communities and their respective Barangay Sub-project Management Committees (BSPMC): Gerlie S Darog of Barangay Macubon, Aloran, Misamis Occidental; Charlyn C Carmelotes of Camp 1 Women’s Organization, Barangay Camp 1, Maigo, Lanao del Norte; and Louzselin H Barrientos of Barangay Mialen, Clarin, Misamis Occidental comprise the regional selection for the Gender and Development Category. “Una sa tanan dako kaayo akong pasalamat sa Kalahi-CIDSS NCDDP, tungod kay nakataak gyud ko ug Cebu nga wala damha ug akong nahimamat ang mga nagkalain-laing tribu kabahin sa ilang tagsa-tagsa ka implementasyon sa programa, akong napamalandungan sa akong kaugalingon nga luyo diay sa akong pag-antos ug pagsakripisyo naa diay kalipay nga akong matagamtaman nga dili nako mahikalimtan sa tibook nakong kinabuhi (first, thank you very much to Kalahi-CIDSS NCDDP, I reached Cebu because of it, here I got to meet different tribes and listen to their experiences in the implementation of the program, I said to myself – there is happiness after all hardships and sacrifices, I won’t forget this for the rest of my life) ” says Charlyn. Neivan Llacuna, Barangay Sub-project Management Committee (BSPMC) Chairperson of Barangay Sindangan, Talisayan, Misamis Oriental represented the community in the Improved Local Governance category. 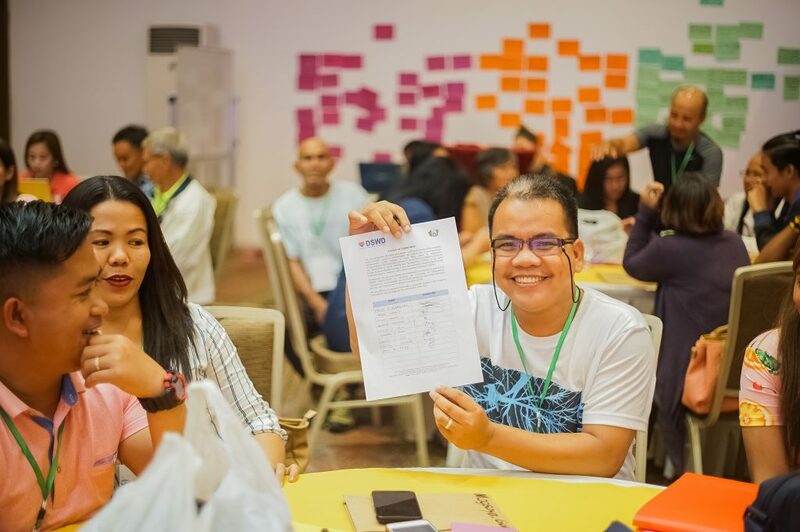 Barangay Sindangan, Talisayan, Misamis Oriental Community Volunteer Nievan Llacuna shows the his affixed signature on the document intended for a signature campaign to lobby for the full institutionalization of the Community-Driven Development approach in all local government levels. “I learned how to deal with different people in the community compassionately and patiently. I learned how to be a volunteer-leader in the community with a heart. Best of all, I learned to love to be a volunteer. In my whole life, I always carry this simple quote of mine which serves also as my energizer in doing my tasks (both as a volunteer and as a mentor) untiringly, When one loves, no service seems too hard” Nievan continues. “Definitely, when we love our work, when we love to volunteer, when there is love, no matter how hard the work is, no matter how there will be conflicts of time and resources, and no matter how heavy the loads we carry, it seems all of these is just a light, simple and easy task to do” Nievan concludes. Geraldine Magsayo of Barangay Bocboc, Don Carlos Bukidnon and Jodie Dura of Portulin, Pangantucan, Bukidnon represent their respective communities in the Sustained Community Volunteers Group category. “Nagadto mi sa Municipality sa Moalboal, tulo ka oras kapin ang byahe but enjoy ra kay daghan view among nakita nga sa TV ra nako usahay makita, nakita usab namo ang Naga nga diin daghan nakalas ng kinabuhi tungod sa landslide, makasubo (we also went to the Municipality of Moalboal, it was a three-hour trip but we enjoyed it because we saw different landscapes that we only get to see on TV, we also saw Naga where there were many lives lost due to landslide, it was heartbreaking)” continues Geraldine. The Northern Mindanao delegation during the Pledge of Commitment to continue advocating for Community-Driven Development. “Nalipay sad ko kay pagcourtesy call namo sa mayor’s office, wala damha nga ang ilang vice mayor, Paz A. Rozgoni, ang nagwelcome kanamo ug siya miingon nga gikan pud diay siya sa Don Carlos, Bukidnon (I was happy when we had a courtesy call at the mayor’s office, I didn’t expect that the vice mayor, Paz A. Rozgoni, welcomed us and revealed that she also hails from Don Carlos, Bukidnon)” enthused Geraldine. “Niadto pud mi sa Barangay Saavedra, Moalboal para sa usa ka field visit, didto namo nasinati ang experiences nila paagi sa us aka focus group discussion, adunay kasakit ug kalipay, makarelate mi sa ilang mga gipangbati isip volunteers (we then went to Barangay Saavedra, Moalboal for a field visit, there we heard their experiences through a focus group discussion, there was pain and happiness, we could really sympathize with them as we are also volunteers)” says Geraldine. “Isang karangalan ang ma imbita ng National Community Volunteers’ Congress dahil doon ko nakita kung gaano ka ganda at epektebo ang programa ng DSWD Kalahi-CIDSS sa ating gobyerno. Dito, may mga bagong tao akong nakikilala at naging kaibigan sa iba’t-ibang lugar ng Pilipinas na nakasama ko sa congress (It is an honor to have been invited to the National Community Volunteers’ Congress, it was here that I saw how beautiful and effective the DSWD Kalahi-CIDSS program of our government is. Here, I met different people and made friends from different places of the Philippines)” Jodie shared. 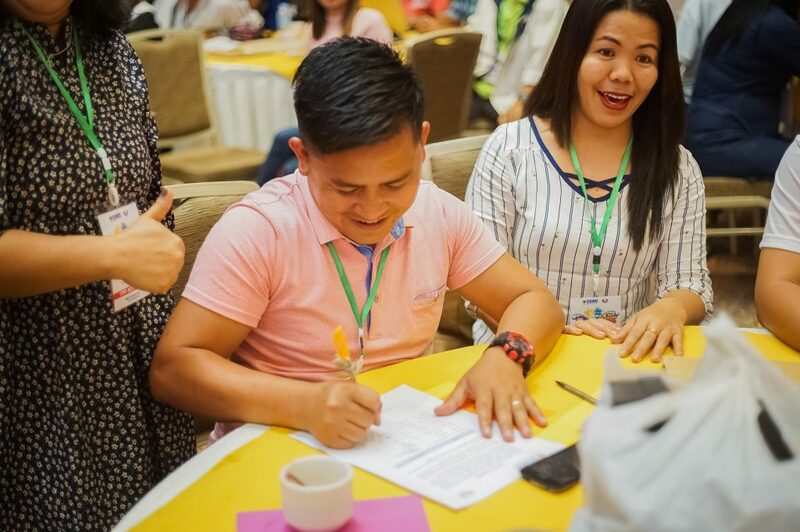 Barangay Portulin, Pangantucan, Bukidnon Community Volunteer Jodie Dura affixes his signature on the document intended for a signature campaign to lobby for the full institutionalization of the Community-Driven Development approach in all local government levels. “Umuwi ako dala ang mga natutunan ko sa CV congress at gustong-gusto ko itong ipamahagi sa aming komunidad lalong-lalo na sa aming Barangay Portulin (I went home, bringing all the learnings from the CV Congress, and I want to share these with our community especially in Barangay Portulin)” concludes Jodie. The Indigenous Peoples’ Welfare category is represented by Evelyn Alampayan of Barangay Pigtauranan, Pangantucan, Bukidnon and Genalyn H Pata of Barangay Penacio, Clarin, Misamis Occidental. They represent the Talaandig and Subanen tribes respectively. “Busa, ako mapasalamaton gyud sa Kalahi-CIDSS nga maoy ni tubag sa among panginahanglan, ug bahin usab sa akong kaugalingon nahimo kong lig-on ug mapaubsanon sa tanan nga mga pagsulay, during implementation sa maong project (I am thankful for Kalahi-CIDSS that paved the way to facilitate our needs, and I learned to be humble in the face of challenges during the implementation of the sub-project)” says Evelyn. Helbert Guiniasan of Barangay Dalingap, Clarin, Misamis Occidental represents his community in the Environmental Protection Category. The DSWD Kalahi-CIDSS Community Empowerment Facilitators also represented the Northern Mindanao delegation: Mae Damming, Glenda Mae Bete, Evangelina Blaya, Billy Jun Jabonillo, and Ebmae Avelino of Pangantucan, Talisayan, Aloran, Clarin, Maigo respectively. They also shared their experiences during the said event. “A potpourri like experience where different stories uncluttered in one bowl, stories that are canvassed from aspiration and authored with integrity” says Jabonillo. “Learnings are the best experience, you don’t just learn by your own experience but hearing all those testimonies and experiences from different people uplift and motivate you to continue volunteerism, inspiring and priceless efforts” shares Bete. “The activity was exemplary it enabled us to fathom and appreciate the experiences and hard-earned success of the community volunteers in engaging and implementing Community-Driven Development (CDD) in their respective communities. Personally, it motivates me to exert my efforts to continue assisting the volunteers and in delivering the social services to the people in order for them to feel the government’s aid that was once labeled as abstract. Also, the community volunteers are the activity’s highlight, showcasing the outcomes of collaborative efforts of the different stakeholders to empower the communities and bring development in their place. Lastly, the activity signifies the community volunteers as agents of change that in the future will influence other people and communities to do the same” says Avelino. 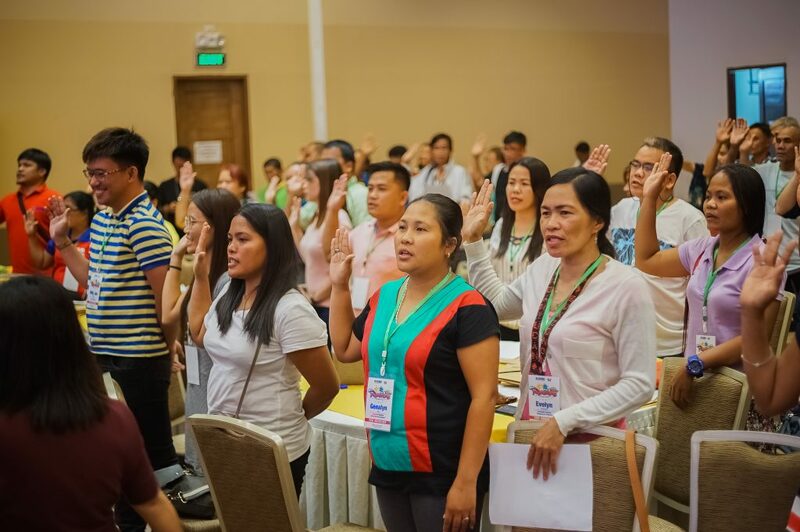 Pagsaulog 2018 also gave birth to the national network of CDD champions dubbed as the Kalahi-CIDSS Community Volunteers Association of the Philippines. Each regional delegation selected a representative to the said association that will be formalized on December 5 this year during the celebration of the International Volunteers Day. The Northern Mindanao delegation will be represented by Nievan Llacuna, community volunteer from Barangay Sindangan, Talisayan, Misamis Oriental. Nievan is also a public school teacher by profession. Pagsaulog 2018 aims at providing an opportunity for the community volunteers and program implementers to promote CDD institutionalization. Some Community Volunteers from different regions visit Barangay Saavedra, Moalboal in Cebu during the 2nd day of Pagsaulog 2018: The 2nd National Community Volunteers’ Congress. Here, volunteers shared their experiences in the implementation of the DSWD Kalahi-CIDSS community sub-projects. DSWD Kalahi-CIDSS in Region 10 covers 45 municipalities in the Provinces of Bukidnon, Lanao del Norte, Misamis Occidental, and Misamis Oriental with a total of 1,105 barangays funded since 2015, amounting to Php 992,386,007.41. This covers Cycles 1 through 3 of the implementation, with a total of 112,279 community volunteers involved in the sub-project implementations. The 1105 community sub-projects include roads, water systems, health stations, flood control structures, electrification, school buildings, pre/post-harvest facilities, foot paths, sea walls, training centers, public markets, and spillways among others. Topping the list of community sub-projects are roads with 599 and water systems with 92. 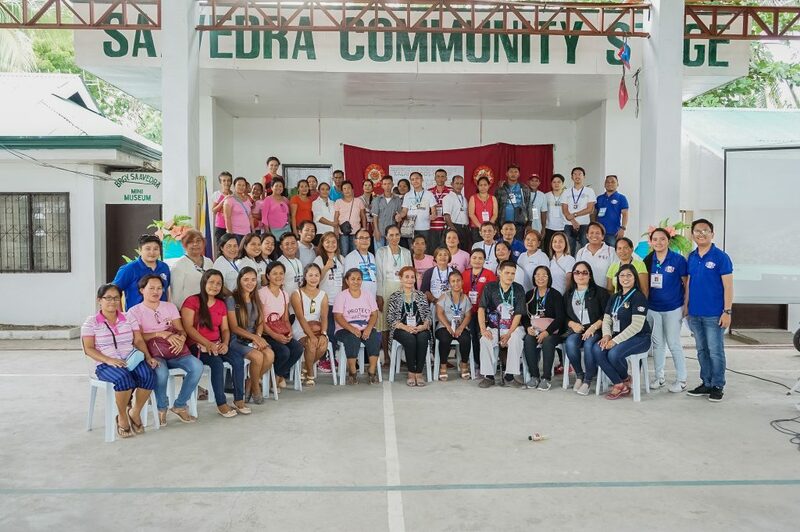 The DSWD Kalahi-CIDSS and its community volunteers are advocating for Community-Driven Development institutionalization in the local governments for the continuation and sustainability of its gains and empowered communities.